The BA418 is crypto engine IP core for SHA-3 hashing functions compliant to NISTS s FIPS 180-4 and FIPS 202 standards. The core has integrated flexibility and scalability to allow for high throughput and a configurable number of hashing rounds to optimize the silicon resource/performance ratio. Standardized AXI-4 I/O simplifies system integration. All our IP cores are delivered with software drivers to simplify ASIC or FPGA integration. 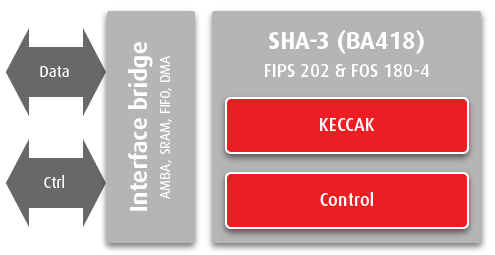 The SHA-3 IP core is available for ASIC and FPGA devices (Altera, Xilinx, Microsemi).